The reverse chronological resume format includes employment history beginning with the most recent and then going backwards. Reverse chronological resumes show dates, as well as employers and educational institutions (college, vocational-technical schools, and career-oriented programs and courses). 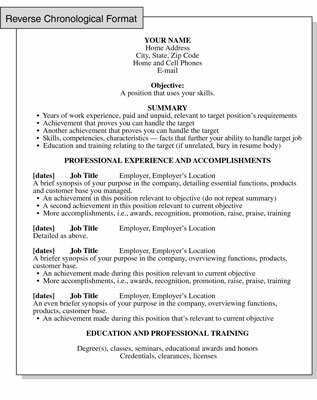 This resume format accents a steady work history with a clear pattern of upward or lateral mobility. Focus on areas of specific relevance to your target position. List all pertinent places you’ve worked, including for each the name of the employer and the city in which you worked, the years you were there, your title, your responsibilities, and your measurable achievements. To handle problems such as unrelated experience, you can group unrelated jobs in a second work history section under a heading of Other Experience or Previous Experience. This upfront format is by far the most popular with employers and recruiters. RC links employment dates, underscoring continuity. The weight of your experience confirms that you’re a specialist in a specific career field (social service or technology, for example). RC positions you for the next upward career step. When your previous job titles are substantially different from your target position, this format doesn’t support your objective. Without careful management, the RC reveals everything, including inconsequential jobs and negative factors. RC can spotlight periods of unemployment or brief job tenure. Without careful management, RC reveals your age. Without careful management, RC may suggest that you were plateaued in a job too long. You have a steady school and work record reflecting constant growth or lateral movement. Your most recent employer is a respected name in the industry, and the name may ease your entry into a new position. Your most recent job titles are impressive stepping stones. You’re a savvy writer who knows how to manage potential negative factors, such as inconsequential jobs, too few jobs, too many temporary jobs, too many years at the same job, or too many years of age. You have a lean employment history. Listing a stray student job or two is not persuasive, even when you open with superb educational credentials enhanced with internships and co-op experiences. You have work-history or employability problems — gaps, demotions, stagnation in a single position, job hopping (four jobs in three years, for example), reentering the workforce after a break to raise a family.